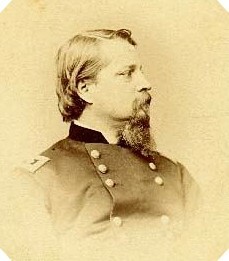 history and life of Major General Winfield Scott Hancock. restoration of these sites, structures and monuments. with the dignity and honor befitting this great American. Committee, a sub-committee of the Historical Society. the exterior was power washed after all the stones were repointed. health of the mausoleum just be viewing it! of trees and bushes, erecting a flag pole and adding small gardens of flowers. by Paul Koons and Bruce Stocking all year long! After the rededication of the Hancock mausoleum in October of 1995, we decided to turn our attentions to educating the public about this magnificent man. 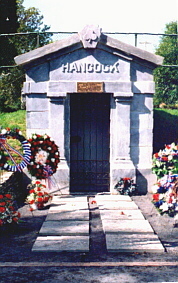 We still kept our name, The Hancock Restoration and Maintenance Committee when it came to working on the mausoleum, but when it came to dealing with the public, we evolved into The W. S. Hancock Society. As we continue to care for the tomb and perform Memorial Day services in May, we now also frequent various reenactments and celebrations spreading the noble story of Winfield Scott Hancock. We have developed a display entitled "Hancock: A Pictorial History" which accompanies us on our outings. 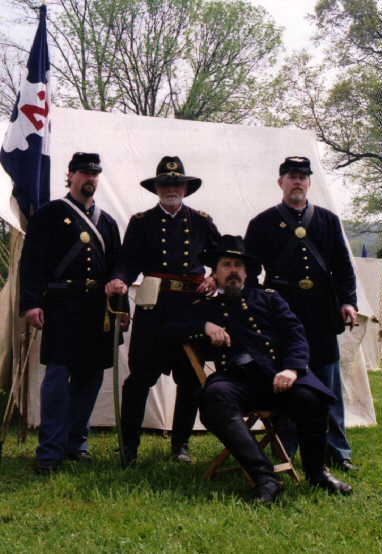 Bruce Stocking, who joined our ranks during the restoration process,portrays General Hancock for us and speaks of his life at various civic groups, churches, scout groups, Civil War Rountables and historical societies. Recently, we have formed a coalition of various Civil War related groups to work with us in the huge job surrounding the renovation of the Smith Memorial which stands in West Fairmount Park just outside the city of Philadelphia. This gigantic Civil War monument is dedicated to the Union generals who hailed from Pennsylvania. 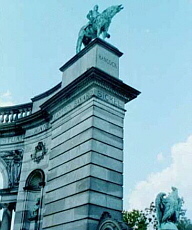 Of course, there is an equestrian statue of Major General Winfield Scott Hancock as he appeared leading the funeral procession of Ulysses Grant along with one of General George B. McClellan and two standing statues on pedestals of General George Gordon Meade and General John F. Reynolds. Other lesser generals have busts tucked away in little alcoves on the monument. The city of Philadelphia's Arts and Culture Council tell us there is no money for this project so, in order to keep our fragile heritage alive, it is a job we feel compelled to do! Your donations for this work (which in total we are told will be about a half million dollars)would be greatly appreciated. Another facet of our society is our deep commitment to the preservation of beautiful Montgomery Cemetery where General Hancock, along with four other Civil War generals, rest. 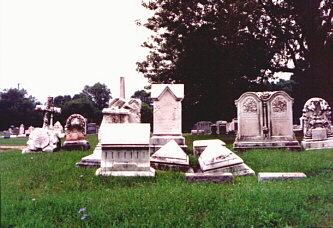 This Victorian cemetery was once the premiere burial site in Montgomery County. Today, hard work by committed volunteers will be required to bring it back from the neglect and decay it has suffered over the years. The Historical Society of Montgomery County now holds the deed to this piece of Norristown History and are currently raising funds to finance the back breaking work associated with restoring and maintaining an American Treasure. Please make your check payable to The W. S. Hancock Society. check where you would like your donation to go.